When I realised that the public school my son has just started at did not offer girls the option of shorts and pants as everyday school uniform, I set about having this changed. I rocked up to the P&C and politely asked that the school add shorts and pants for girls to the uniform policy. While I expected a comment along the lines of, “Gosh, I can’t believe we don’t offer shorts for the girls, let’s make this change,” I was instead met with stubborn refusal. For a good year I was bamboozled as to why adding shorts and pants for girls was being resisted so strongly by the school. I wasn’t asking for a uniform change, just a simple addition. The boys wore shorts and pants, so making these available to girls would not be complex. Had I read widely about the history and nature of schooling and school uniforms before asking for a uniform change, I would have been more prepared for the resistance I encountered. The gendered nature of schooling has been explored in relation to whether boys or girls are advantaged or disadvantaged in coeducational settings. It has been argued that boys continue to be observed being more active than girls during free time, participating in more informal sport and dominating the available spaces (Fairclough, Butcher & Stratton, 2008; Hobin et al., 2012; Norrish et al., 2012; Woods, Graber & Daum, 2012). What has been less researched is the role that gendered school uniforms play in reinforcing this status quo. Indeed, at my children’s (now former) school, the P&C and principal refused to acknowledge that girls were unable to play freely in their school dress. While they denied that the uniform had gendered disadvantages that only girls faced, they readily articulated that girls needed to wear skirts and dresses so they were prepared for the workforce (an argument easily refuted), and the principal noted how nice the girls looked in their dresses. Equally as alarming was the realisation I came to that the image of the school took precedence over the needs of the children. 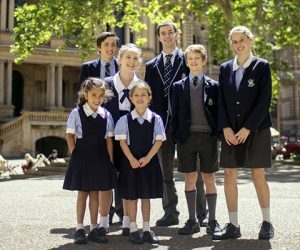 English (2004) describes students in uniform as ‘transportable advertising’ (p. 53) and as a consequence school uniforms are part of the impression management undertaken by schools operating in the education market (Symes, 1998). As Kenway and Bullen (2001) note, most schools are obsessed with students’ appearance and the uniform is a central feature of this obsession (p. 143). When I heard this from the deputy principal I initially felt shock, then anger, and finally a deep sadness. I am one of many parents who chose a public school education for my children due to the values I believed this sector represented, such as diversity, tolerance, inclusion and equity. It appears however that a number of public schools are prepared to trade the rights of their girls for a perceived advantage in their image. Do we really want to teach our children that the way they look, and the (smoke and mirrors) image they are creating, is more valuable than their needs, and the actual educational experience they are having? It is true that students arrive at school with gendered understandings drawn from society. Schooling can lead to these understandings being supported or transformed and gender stereotypes strengthened or challenged. For as long as we continue to deny girls a choice in their everyday uniform options because we believe that as girls they must wear dresses and skirts, we reinforce gender inequity. As Mary Barry (2017), the CEO of Our Watch wrote: “Continuing to enforce limiting clothing regulations on girls is one of many ways they are reminded of their unequal status. It is seemingly “small” issues like this that, taken together, create a broader landscape of gender inequality across our society. While schools may argue many reasons for keeping things the way they are, including protecting their precious marketing strategies, I’d rather they acknowledge the harm done to children when gender inequity is reinforced, and place their precious students first.